Whether you're a history buff, a budding photographer or someone looking to tick a whole lot of destinations off their bucket list, this trip through England, Scotland and Ireland is for you. 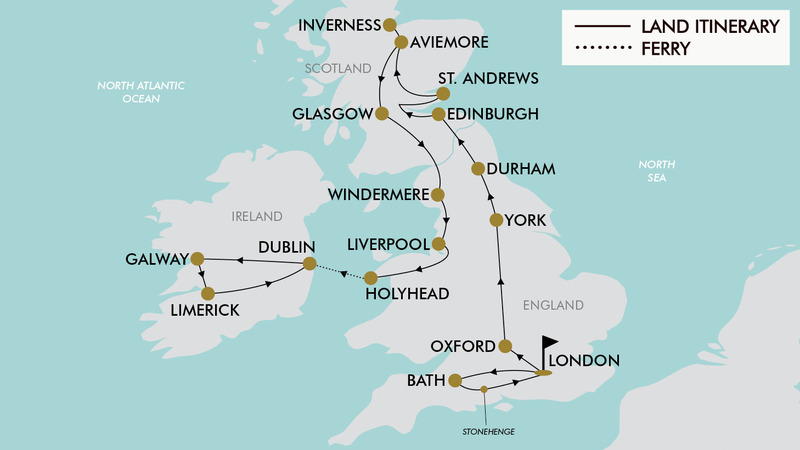 From Stonehenge to Loch Ness and the Cliffs of Moher, this 18-day journey takes in all the highlights of the United Kingdom. Hear the fascinating stories of London, Edinburgh and Dublin on guided tours; explore the historic town of Oxford, home to the oldest university in the English-speaking world; enjoy free time in the Georgian city of Bath, where you'll find the famous Roman Baths and Royal Crescent; visit the prehistoric monument of Stonehenge; journey through the Scottish Highlands and scenic Lake District, trying a whisky at a traditional Scottish Whisky Distillery; tour Edinburgh and Windsor Castles, and see UNESCO-listed Durham Castle; keep an eye out for Nessie at Loch Ness; visit the breathtaking Cliffs of Moher; and so much more. With return international flights, 15 nights hotel accommodation, daily breakfast and return airport transfers all included, get ready to take on some of the world's most beautiful cities, villages and castles. Today depart from Auckland or *Christchurch for London, England. Fly with award winning Qatar Airways or Emirates (subject to availability). Day 2 Welcome to London! Upon arrival, be met and transferred to the hotel. Today enjoy a panoramic tour of London. Take in famous sights such as Trafalgar Square, Piccadilly Circus, Covent Garden, Regent Street, Oxford Street and more. See the Albert Memorial, Royal Albert Hall, Parliament House and the London Eye Ferris wheel. Next travel past the Tower of London; a medieval fortress built in the year 1078 by William the Conqueror. This afternoon travel to Windsor Castle. Along the way you will pass through Thames Valley and Runnymede, where there are monuments of the Magna Carta and US President Kennedy. Windsor Castle has been inhabited since the 12th century by royalty. From here, you can see the renowned College of Eton, one of the most exclusive schools in the country. Visit the beautiful Royal Chapel of St. George (except during special ceremonies), an example of Gothic perpendicular style; The Mausoleum of the Kings; and the Royal Apartments, splendidly restored after the fire of 1992. Afterwards return to London for an evening free at leisure. After breakfast this morning you will depart for the Georgian city of Bath. This UNESCO World Heritage Site boasts some of the most exquisite architectural and historical treasures in Europe including The Roman Baths, its 15th century abbey, and the impressive Royal Crescent. The popularity of Bath has increased thanks to the reopening of its thermal spa. They are the only natural thermal baths in Britain that offer the possibility of bathing in temperate waters, as the Roman and Celts did 2000 years ago. Afterwards you will visit Stonehenge, one of the most important prehistoric sites in England. Afterwards return to London. Today your journey continues as you travel to York via Oxford; home to the University of Oxford, the oldest in the English-speaking world. It’s known as “the city of dreams”, an expression coined by Matthew Arnold to describe the harmony in the architecture of university buildings. Upon arrival enjoy a panoramic tour of the city, including Christchurch College, Oxford’s largest and most popular. See the inner courtyards and the Cathedral, the smallest of the country. Afterwards continue to York and upon arrival enjoy an orientation tour with the tour leader to see its ramparts, the Shambles and the wonderful York Minster Cathedral. Few British cities possess the magic and charm of York, a result of its outstanding architecture and more than 2000 years of history. Enjoy some free time this morning in York to explore the city on your own. Afterwards depart to Durham, where an orientation tour will take in the market square and its pioneering Romanesque Cathedral, which together with the Norman Castle, dominate the city. As you travel onwards to Edinburgh, you can admire Hadrian’s Wall, a defensive fortification in the Roman province of Britannia, begun in 122AD in the reign of Emperor Hadrian. Edinburgh is traditionally said to have been built on seven hills, and sitting proudly atop one of these hills is the majestic Edinburgh Castle. Spacious and beautiful, Edinburgh is a city that knows how to combine the legacy of its medieval past with beautiful gardens, Georgian mansions and the modernity of its lively artistic life. Today enjoy a sightseeing tour of the city with a local guide. Visit Edinburgh Castle (entrance included), which began construction in the 11th century, and Princes Street which is flanked by beautiful gardens and imposing Georgian buildings that separate the new city from the old. See the department store Jenners, the oldest in the city, followed by St. Giles Cathedral, founded in the 12th century. Enjoy the remainder of the day free at leisure. This morning, depart for the Scottish Highlands, home to many historic castles, islands and lakes. Many of the symbols that make up the Scottish idiosyncrasy, such as the skirt, tartan plaid, bagpipes and feather cap come from this mountainous region. Stop in the city of St. Andrews and see the ruins of what was the largest cathedral in the country. See the birthplace of golf at the Royal Ancient Golf Club. Afterwards continue to Dundee to see the Castle of Glamis and stop at a traditional whiskey distillery factory where you can sample local whiskey. Afterwards continue to Aviemore and check into the hotel. After breakfast depart for Inverness, where you will see the Clava Cairns, a prehistoric monument and Bronze Age cemetery. Pass by the Battlefield of Culloden, the site where the last battle was carried out on British soil. Travel onwards to the famous Loch Ness before travelling back to Aviemore where you can enjoy the remainder of the day at leisure. After breakfast, depart for Glasgow. Travel down the Great Glen, passing through Fort Augustus and Fort William and the dramatic Glen Coe Valley. Afterwards stop for a photo of Stirling Castle (entrance not included); declared a National Monument. This famous castle is perched atop a hill and surrounded on three sides by cliffs. Most of the main buildings date back to the 15th and 16th centuries and the outer defences facing the city dates back to the early 18th century. Afterwards continue onwards to Glasgow for the night. Today enjoy a free day in the vibrant and energetic city of Glasgow known as the capital of style in Scotland, with its many art-deco restaurants, boutiques and cultural centres. This morning depart to Windermere in the heart of the Lake District, which offers fantastic views of the English countryside and surrounding mountains. Next depart for Liverpool, hometown of the Beatles. After London, Liverpool has the second most theatres, museums and galleries in the UK. The city has a fabulous architectural heritage. Upon arrival transfer to the hotel in Liverpool and enjoy the rest of the day at leisure. After breakfast travel to Holyhead to board the ferry to Dublin (approx. 3 hours). Upon arrival, enjoy the rest of the afternoon at leisure in the Irish capital city. This morning enjoy a traditional Irish breakfast, before enjoying a half-day guided tour of St. Patrick’s Cathedral (entrance included) - the largest of the two cathedrals in Ireland. The Cathedral of St. Patrick was built next to a well in which, according to legend, St. Patrick baptised those who converted from paganism to Christianity. You will also get a chance to look inside the ivy-covered stone buildings of Trinity College to see the Old Library’s vast rows of antiquarian books. Afterwards pass Dublin Castle, before continuing to Galway via the monastic site of Clonmacnoise Abbey (entrance not included). Galway (in Gaillimh Gaelic: “rocky river”), owes its name to the bed of stones of the Corrib, the river that crosses it. Upon arrival you will see the Collegiate Church of St. Nicholas, founded in 1320 thanks to the famous Lynch family (one of the 14 tribes of Galway) in honour of St. Nicholas of Myra (patron saint of sailors). Next see the Catholic Cathedral of Our Lady of the Assumption and St. Nicholas, the Lynch Castle, the Court of Justice and the Old Town Hall. Today start the day early with a visit the UNESCO World Heritage Listed Cliffs of Moher, which towers 214m above the level of the Atlantic Ocean at its highest point. Enjoy a brief stop in Limerick, the third most populated city in the country, where the King John Castle, one of its main attractions, stands out. Continue onwards to Dublin for the night. Today enjoy your last day free at leisure in Dublin. Take some time to enjoy the city’s sensational dining, music and pub scenes. Today you will be transferred to the airport for your return flight back to New Zealand! Please note: if your flight departs early, breakfast will be arranged for pick up from the hotel reception the night before. Please note, some flights may arrive in New Zealand +1 day later. Any special requests, preferences and optional extras MUST be clearly stated in your Passenger Information Form. Any changes requested after submitting your Passenger Information Form cannot be guaranteed, is strictly subject to availability and will incur surcharges as outlined in the Schedule of Fees below. Travel offer is valid for travel on selected dates until 12th October 2020. For solo travellers, a mandatory single supplement of $2000 applies. Please note: Dates/months with a * incur a flight high season surcharge of $200 per person. Qatar Airways, Emirates plus any codeshare partners (subject to availability). * Dubai - An outbound and inbound stopover may be chosen; however the stopover location must be the same each way, due to the airline used. - London, England (Pre Tour): $370 per room including breakfast. - Dublin, Ireland (Post Tour): $380 per room including breakfast. - Recommended gratuities/tipping: £4 per person/day which will be collected whilst on tour. Both May and June are very pleasant times to visit the UK and Ireland when the weather is mild and the flowers are blooming. At this time of year, the average temperature is 16°C, which is considerably warmer than the previous months. July and August is when the summer season is coming to a close. During these months, the average temperature is 18°C. As August progresses, the daily temperatures slowly decrease as summer blends into autumn. The weather starts to cool down in September, when the autumn season is setting in. During this time of year the average temperature is 16°C. Daily breakfast is included in the tour, for all other meals; lunches and dinners the tour leader (when available) will offer assistance with reservations, suggestions and directions to local restaurants. It is your responsibility to notify TripADeal of any dietary requests/requirements. Please note; we will do our best to meet your requests/requirements, however, cannot guarantee that we will always be able to. Gratuities (tips) are not included in the tour price for services of the tour leader (when available) and driver throughout the tour. The recommended tip is £4 per person per day this covers the guide/leader and the driver, which will be collected whilst on tour. A tourist visa is not required if travelling on a New Zealand passport for stays up to 90 days.